We are putting this plea out to our Facebook fans after Trigger’s owner sent us this heartwrenching email. If you or someone you know adopted Trigger, please call Danielle at the number on the flyer. My family and I have come across a situation involving our lost dog. 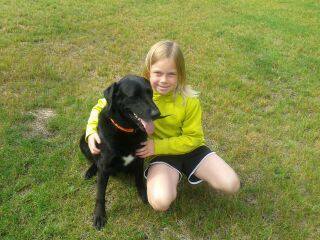 We are from the Wabeno area and lost our dog Trigger on June 15. We were visiting friends and their dog and ours ran off chasing the North woods wildlife. Our friends dog came back, ours did not. Immediately, Sunday June 16 I contacted Forest, Langlade, Marinette, Oconto, Bay Area and Fox Valley Humane societies along with Forest, Oconto, and Marinette Sheriff’s departments. I also posted an ad on lostdogsofwi.org and all over Facebook. Flyers were put up in the Wabeno and Lakewood areas. For days our friends and neighbors in the area kept and eye out for Trigger and my husband and I made many trips down the backroads looking for Trigger. Come to find out he was found on June 19 on Knowles Creek Rd (connects Hwy C and F, towns of Wabeno and Lakewood) by some campers who brought him into Lakewood. From there they called the animal control officer and told him they would adopt Trigger if no one claimed him. Unknown to us, Trigger was still alive, but no calls came to us. We had no knowledge of an animal control officer in the Northern Oconto County area and continued our search around the area he went missing. The animal control officer never looked for local posters, called a humane society or sheriffs department. Frankly, he did not do his job. On Thursday, June 20 a friend from Mountain called us and said they knew our dog was alive and picked up by the animal control officer. We contacted him immediately and he told us our dog was just adopted through him by a couple from Waupaca, the same couple that found him. He reassured us the couple really wanted to reunite the dog they adopted with its family and getting him back wouldn’t be a big deal. Then the problems started to arise. First, he couldn’t get a hold of the people that adopted Trigger. Then when he did get in contact with them he would not release our information to them or their information to us. He was and still is completely stonewalling our dog coming back to our home. This man is appointed by the town boards of Townsend, Lakewood, Riverview, Mountain, Breed and Doty. I have put in calls to everyone of these towns chair people to see if they can get him to reason. I had a Forest County patrol officer speak with him as well as an Oconto County officer. For some reason he feels that he is not responsible for reuniting a dog with its family and is still withholding this information. 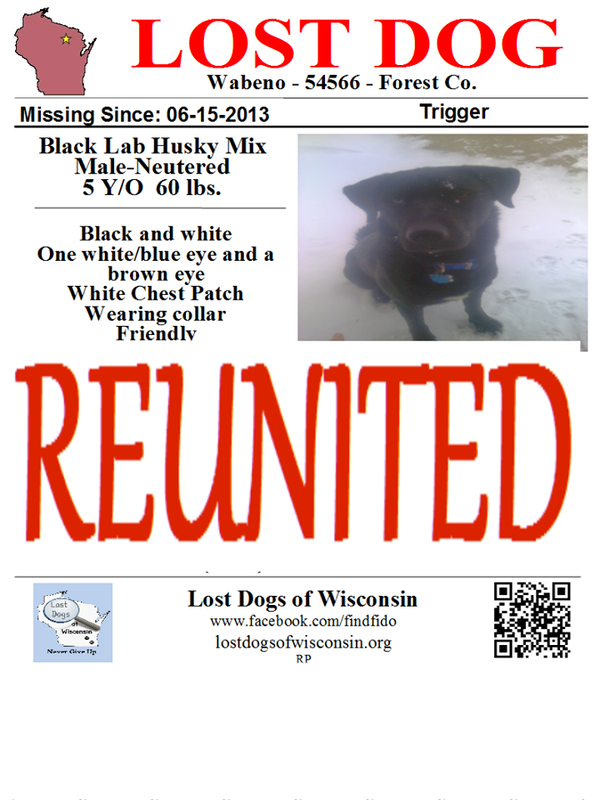 Now I am trying to reach out to the couple from Waupaca who adopted Trigger by any means necessary. I have an article ready to go into the Waupaca County Post, but it will not run for another week. All I ask is that these people are made aware we are doing everything in our power to find them and reunite with our dog. The picture attached is not the best picture but it is the only one I have with any possible detail of his face. It looks like he has white above his left eye but it is actually snow.